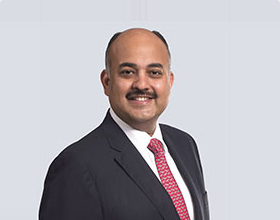 Prasanth Manghat is the Chief Executive Officer and Executive Director of NMC Health Plc., UAE’s largest private healthcare company and amongst the top three fertility providers in the world. Over the past 15 years, Prasanth has built a distinguished career at NMC. Prior to becoming CEO and Executive Director, he was the Deputy CEO, CFO at NMC and CFO at Neopharma. He spearheaded NMC Healthcare’s book building process during its IPO in 2012 at the LSE UK, raising US$187.5m in less than 100 days. Under his guidance, delivering ﬁve years of unprecedented growth, NMC became the ﬁrst Middle Eastern company to feature on the FTSE 100 with a market capitalization of over US$ 8bn. Prasanth also lead the NMC’s distribution services division which is now one of the largest in UAE in terms of its diverse product portfolio of over 100,000 SKUs. Products are imported from over 90 countries around the world and distributed to over 7,500 points of sale in the UAE. As an industry thought leader, Prasanth has authored articles giving his thoughts and views on Universal Healthcare via the National Health Scheme Programmes- India and his predictions on the GCC’s healthcare system. He has participated in the World Economic Forum meets at Davos, India and Africa (2018) as one of the panelists where he spoke about the topics of The Hospital of the Future and Tech in Health. The industry looks up to Prasanth as a turn-around-guy who with his ideas, and their implementation, on the use of technology in healthcare and the importance of community service in healthcare, has made his company rise above the rest while the healthcare industry in the geography still grapples with countless issues challenging its growth or even survival at times. Prasanth is a much sought-after domain expert in the various industry specific events and orations, in both Govt. and private, when it comes to subjects like, Healthcare in the UAE/GCC, Tech in Healthcare, the M&A in healthcare and the future of healthcare in terms of IVF, Long Term Care, Paediatrics, Geriatrics and Non-Communicable Diseases (NCDs) like obesity, diabetes, hypertension etc. He has always been in the pursuit of excellence and has been well-recognised via awards and accolades from institutions across the board. Prasanth serves on the advisory boards of various government and elite organisations and is currently a member of the Strategic Council, Department of Health since March 2018. Prasanth was honoured with the annual Arabian Business Achievement Awards 2018. Acknowledging his contribution in authoring NMC’s brand-leadership position in GCC and worldwide, Forbes Middle East recognized him with an inclusion in the coveted Top 50 Indian Executives in the Arab World in its 2018 edition. He also was named as the NRI of the Year 2018 by the Times Now for his contributions to business and community. Prasanth also won the ‘Deal Maker of the Year’ award at the 10th CFO Strategies Forum MENA, ‘CFO of the Year’ award in 2012 by ICAEW.